Pull up the lever until the lock is completely released. 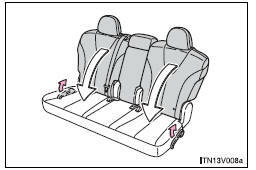 Stow the seat belt buckles and lower the head restraints to the lowest position. 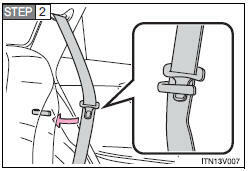 Pass the outer seat belts and plates through the seat belt hangers. Fold down the seatback while pulling the seatback angle adjustment lever. Do not recline the seat more than necessary when the vehicle is in motion, to reduce the risk of sliding under the lap belt. 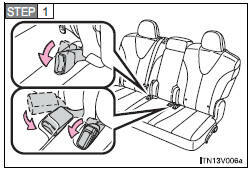 If the seat is too reclined, the lap belt may slide past the hips and apply restraint forces directly to the abdomen or your neck may contact the shoulder belt, increasing the risk of death or serious injury in the event of an accident. 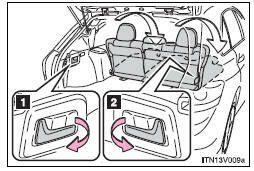 Do not fold down a rear seat when there are passengers sitting in the rear seats or when there is luggage placed on the rear seats. • Be careful not to get your hands pinched in the seat. 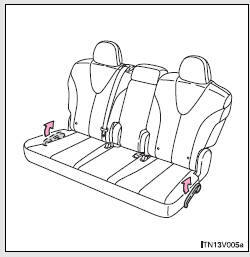 • Make sure the seatbacks are securely locked by lightly rocking it back and forth. • Check that the seat belts are not twisted or caught under the seat. • Arrange the seat belts in the proper positions for ready use. The seat belts and buckles must be stowed.